Do you want to make a difference in the development of your home country? 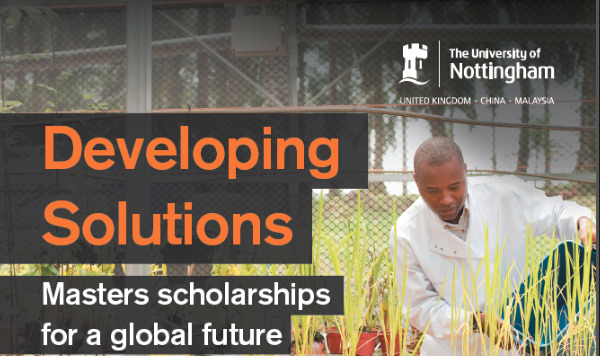 University of Nottingham is proud to be offering full tuition fee scholarships in conjunction with Developing Solutions Scholarship Scheme. About Scholarship: Founded in 2001, Developing Solutions is The University of Nottingham’s flagship international scholarship programme for postgraduate masters courses. How to Apply: You’ll need to first apply for admission for Masters degree and be registered as a full-time student at the university. It is important to go through the Application requirements before applying. Important to Note: Application for admission to study at Nottingham should be received at least six weeks before the scholarship closing date to allow time for our Admissions office to process the application and confirm your offer, before you can apply for the scholarship. Any application for admission to study submitted later than six weeks before the scholarship closing date is not guaranteed to be processed in time.